A sectarian St Patrick’s Day attack in Sandy Row is the second reported assault in the area in two years, with last year’s victim being the tragic north Belfast man who lost his life in the Lagan this January. The attack, which involved a gang of around 12 teenagers, occurred at the junction of the Lisburn Road and Sandy Row and follows a similar assault on teenager Joby Murphy in the area on St Patrick’s Day last year. 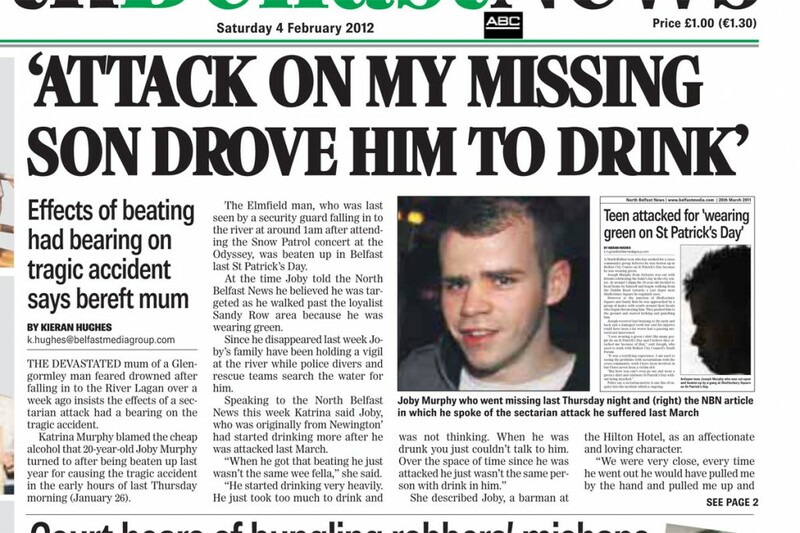 Joby, who died in a drowning accident in the River Lagan in January and whose body was not recovered for four weeks, told our sister paper the North Belfast News at the time that he believed he had been attacked because he was wearing green. This year’s victim was making his way towards his home off the Lisburn Road when he was attacked by the gang who also stole a plastic bag and its contents. They then ran off into Sandy Row after a resident of a nearby house came out to assist their victim who sustained a badly bruised and swollen left eye and jaw. Leading loyalist, Jackie McDonald who condemned the attack saying it was ‘totally wrong’ said youths in Sandy Row were ‘defending their loyalism’. “I was unaware of this incident taking place but I am totally against it and it shouldn’t be happening. “In the past people have wandered into the wrong areas donning ginger beards and green, white and orange clothing and young fellas in the area feel threatened to defend their loyalism,” he said. Following his death this year the mother of Joby Murphy blamed the sectarian assault he suffered in Sandy Row as a significant factor contributing to his death. Katrina Murphy said following the assault on her son on St Patrick’s Day 2011 he turned to cheap alcohol which she believed contributed to his tragic drowning in the River Lagan in January. Police have made an appeal for witnesses to this year’s assault to come forward.